This difficult to find child's tin lunch box has a hinged handle and lid and dates to the 1920's. This child' candy box measures 4 3/4" long x 2 3/4" wide x 2 3/8" tall. This comes from the Thomas Lamb litho collection. Good detailed lithographs of many of the popular Nursery Rhyme characters. 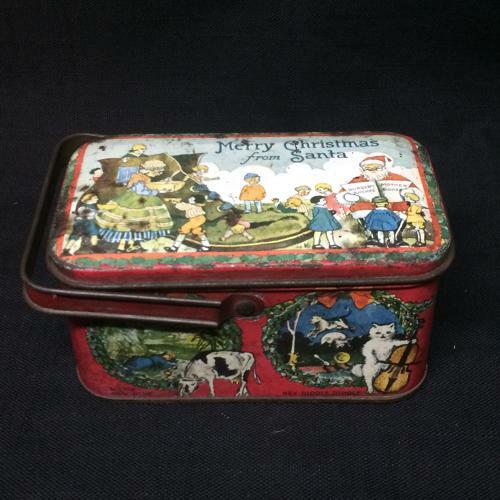 The lid features Santa reading Nursery Rhymes to children and Mother Hubbard and her Shoe. This tin has them all. Condition is very good with nice colors, one of the best we have ever seen. Hinges and handle in great condition. No denting. Rusting appropriate with age and use.